Will Smith is an American actor, producer, rapper, comedian, and songwriter. Will Smith has a son Trey with his first wife Sheree Zampino. He has a son Jaden and daughter Willow with his wife Jada Pinkett Smith. His full name is Willard Carroll Smith Jr.
Will Smith was offered the role of Neo in The Matrix but chose to do Wild Wild West instead. Wild Wild West turned out to be a box office bomb. Smith was born on September 25, 1968 in Philadelphia, Pennsylvania. Will Smith has played father and son roles in two films with his son Jaden, The Pursuit of Happyness (2006), and After Earth (2013). Will Smith was cast in the movie Suicide Squad to play Deadshot (2016). His father, Willard Carroll Smith, Sr., was a refrigeration engineer while his mother, Caroline (Bright), was a Philadelphia school board administrator. In the late 1980s, Smith achieved modest fame as a rapper under the name The Fresh Prince. He formed an alliance with schoolmate and deejay Jeffrey Townes, whom he met in 1981. They began recording as DJ Jazzy Jeff and the Fresh Prince. In 1988 the group released the groundbreaking single “Parents Just Don’t Understand,” which went on to win a Grammy Award (the first Grammy ever presented in the rap performance category). Most of Will Smith's summer blockbuster movies open in July so he has been nicknamed Mr. July in the media. In 1990, his popularity increased dramatically when he starred in the popular television series The Fresh Prince of Bel-Air. During the series’ run, Smith garnered two Golden Globe Award nominations and served as an executive producer for the final season. Will Smith starred in the Men in Black movies along with Tommy Lee Jones. Will Smith played Muhammad Ali in 2001 in the movie Ali. Buoyed by his small-screen success, Smith expanded into cinema with Where the Day Takes You (1992). His first leading role was in the film version of John Guare’s successful stage play Six Degrees of Separation (1993). The action comedy-thriller Bad Boys (1995), however, proved to be the turning point in his film career. While the movie was not a critical success, it made more than $100 million worldwide, proving Smith’s star power. In 1996, Smith starred as part of an ensemble cast in Roland Emmerich’s Independence Day. The film was a massive blockbuster, becoming the second highest-grossing film in history at the time and establishing Smith as a prime box office draw. Jada Pinkett Smith, who would become Will Smith's wife in 1997, first met him when she auditioned to play his girlfriend on The Fresh Prince of Bel-Air. She didn't get the part. He later struck gold again in the summer of 1997 alongside Tommy Lee Jones in the summer hit Men in Black playing Agent J. It received worldwide acclaim, with critics highly praising its witty, sophisticated humor, Jones and Smith’s performances. During the summer of 1997, Smith also began his solo career with the release of “Men in Black”, the theme song for the film of the same name. In 1998, Smith starred with Gene Hackman in the conspiracy-thriller Enemy of the State. In 1999, Smith turned down the role of Neo in The Matrix in favor of Wild Wild West (1999). He once stated that in his whole career, he most regrets turning down the part of Neo in The Matrix (1999) and the film that he most regrets making was Wild Wild West (1999). Will Smith became the very first hip hop artists to be nominated for an Oscar. Smith’s second album Willennium was supported by the release of a film theme song as the lead single: “Wild Wild West”, featuring Dru Hill and Kool Moe Dee. In 2001 Smith portrayed heavyweight boxer Muhammad Ali in the biopic Ali. For his performance he was nominated for the Academy Award for Best Actor, and the Golden Globe Award for Best Actor – Motion Picture Drama. In 2002, following a four-year musical hiatus, Smith returned with his third album Born to Reign. A couple of sequels were next, with Smith reprising his roles in Men In Black II (2002) and Bad Boys II (2003). In 2004, Smith starred in the science fiction action I, Robot. Will Smith began appearing in movies while still filming his TV show, including Where the Day Takes You (1992), Made in America (1993), and Six Degrees of Separation (1993). Smith gained a place in the Guinness World Records book for most public appearances in 12 hours, by attending three red carpet “premieres” for Hitch (2005) on 22nd February 2005. He walked the red carpet and introduced the film at Manchester, Birmingham, and finally for the premiere in London, England. Smith’s latest album Lost and Found was also released in 2005. In 2006, he starred in the biographical drama The Pursuit of Happyness, and his performance as a single father who overcomes adversity earned him a second Oscar nomination for best actor. In 1990 NBC created a TV show about Will Smith called The Fresh Prince of Bel-Air. The show ran for 6 seasons and was syndicated as a result of its popularity. In 2007, Smith starred in the post-apocalyptic science fiction I Am Legend. Smith then took on the dual role of actor and producer for Hancock (2008), in which he played an alcoholic anti-superhero, and for Seven Pounds (2008), about a man who sets out to change the lives of seven people. In 2012 Smith again reprising his role as Agent J in Men in Black III. This was his first major starring role in four years. Men in Black III was released ten years after release of Men in Black II (2002), and grossed over $624 million worldwide. Unadjusted for inflation, it is the highest-grossing film in the series. Between 1988 and 1989 Will Smith spent too much money and was found to owe $2.8 million in income taxes. He lost many possessions and his income was garnished. He almost went bankrupt. In 2013, Will starred in After Earth with his son Jaden. The film was a disappointment at the domestic box office and was panned critically. In 2015, Smith portrayed a con artist in the thriller Focus and the doctor who discovered the epidemic of chronic traumatic encephalopathy (CTE) among NFL players in Concussion. In 2016, he played the assassin Deadshot in the action thriller Suicide Squad and a grieving father in Collateral Beauty. His most recent movie, Bright was distributed via Netflix on December 22, 2017. It is the most expensive movie for Netflix so far. Smith has been nominated for five Golden Globe Awards and two Academy Awards, and has won four Grammy Awards. Will Smith has an estimated net worth of $260 million. The rap song Summertime won DJ Jazzy Jeff & The Fresh Prince their first Grammy. Smith married Sheree Zampino in 1992. They had one son, Trey Smith, born on November 11, 1992, and divorced in 1995. Smith was a millionaire before the age of 20. He spent money freely around 1988 and 1989 and underpaid his income taxes. The Internal Revenue Service eventually assessed a $2.8 million tax debt against Smith, took many of his possessions, and garnished his income. 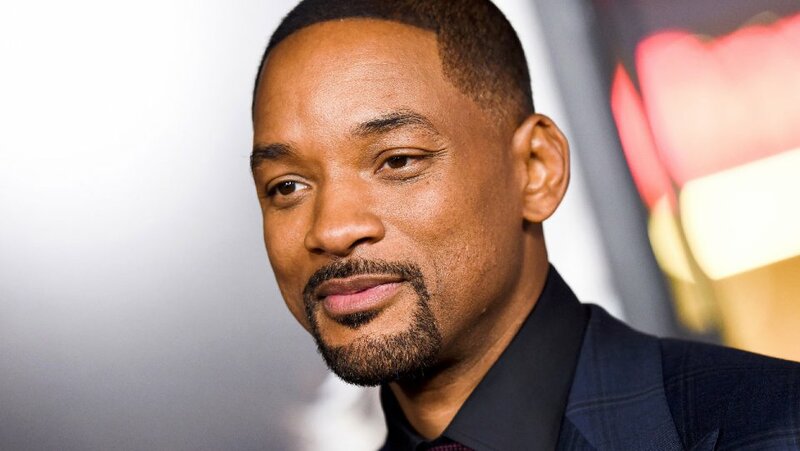 Smith was nearly bankrupt in 1990, when the NBC television network signed him to a contract and built a sitcom, The Fresh Prince of Bel-Air, around him. Smith has solved Rubik’s cubes in both The Fresh Prince of Bel Air and The Pursuit of Happiness. This is a real talent of his; he has shown on live TV that he can solve a Rubik’s Cube in under 55 seconds. Will Smith's mother was a school board administrator. His father was a refrigeration engineer. Smith incorporates the line “Aw, hell no!” into all his movies as a running catch phrase like Arnold Schwarzenegger’s “I’ll be back!”. Smith is often called “Mr. July” by the media due to the fact that most of his summer blockbusters open in July. In 2009 Will Smith and Jada Pinkett Smith hosted the Nobel Peace Prize Concert in Norway. It was to celebrate Obama winning the honor. He was the first guest on The Tonight Show Starring Jimmy Fallon. Smith is supposedly a huge fan of the Swedish well-known (but barely known in the U.S.) melodic heavy metal band Soilwork. The Bridge on the River Kwai (1957) is his favorite movie. Smith is huge fan of professional wrestling.